LOUISBOURG, CAPE BRETON, NOVA SCOTIA — No lawyers were allowed in colonial Louisbourg. Louis XIV wanted to build a utopia on this side of the Atlantic and anyone who was out to practice law could only undermine that dream, the Sun King thought. So rules were enforced by the governor of Île-Royale and an appointed council. But lawyers? They were left to eat cake — or learn to bake it. Today, Louisbourg still exhibits the spirit and mindset of its founders. Set in 1744, toward the end of French rule of the territory on Cape Breton, the recreated historic village replicates life as it was for the blacksmiths, tavern owners, military personnel, government officials and citizens in the 18th century. To enter the fortified city, visitors must first pass through a gate defended by militia who will test whether you’re a British spy or ne’er-do-well before allowing you to enter. Thoroughly fascinating, Louisbourg is so well done as an attraction you almost lose sight of the beauty of its setting. Almost. Cape Breton’s natural allure never quite relinquishes its grip and the scenery surrounding Louisbourg is reminiscent of the French coast, with a torrent of waves and swatches of thick, golden reeds that from certain angles appear to mask the fortress as you approach. “Louisbourg is the jewel of the national parks system,” says Linda Kennedy, who runs Point of View Suites, a sensational property just outside of the entrance to the historic site. For those who have been to colonial Williamsburg in Virginia, Fortress Louisbourg will seem familiar. But it is much more of a living museum than a commercial enterprise, although you can purchase meals and pay to take part in a murder mystery tour or night-time lantern walk. In 2013, Louisbourg celebrates its 300th anniversary and will do so with panache, earning it the distinction as the No. 1 place in Canada to visit in 2013 from Vacay.ca. The Louisbourg300 festivities feature a month-long fête with additional music, cultural attractions and a harbourside market in July. A series of other events and celebrations will take place during the summer, including a much-anticipated regatta on the waters surrounding the fortress. As Louisbourg heralds its tricentennial, it gives Canadians an opportunity to reflect on how important of a place it is to the nation’s history. “Louisbourg in some ways is a microcosm of what Canada eventually developed into, which is a multicultural, multilingual society,” says Barbara Landry, one of the Parks Canada officers at the fortress. MOUNT STEWART, PRINCE EDWARD ISLAND — Olympic moments happen across this country on a daily basis. The participants may not be going for gold medals like the competitors at the London 2012 Summer Games, but they are striving to achieve ultimate success. Although they do it in obscurity, the spirit with which these entrepreneurs pursue their goals is similar to the dedication elite athletes have for their disciplines. I recently came across a couple of examples of Canadians in the travel and hospitality industry who are giving it their all as they chase their dreams. 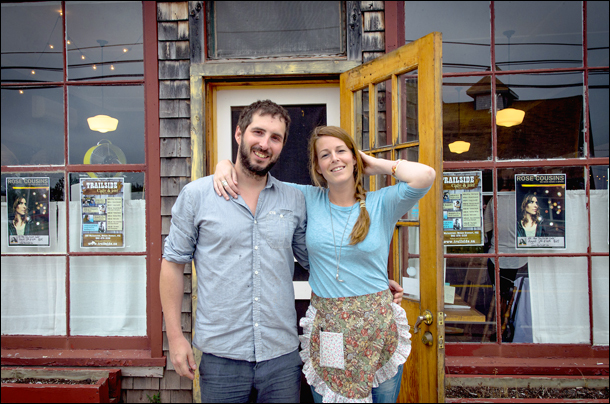 Pat and Meghann Deighan were married on December 30, 2011, about two weeks after they purchased the Trailside Inn and Café, a venue 30 minutes outside of Charlottetown that has been a reliable spot in Prince Edward Island for good music and good times. The Trailside was in need of rescue and the newlyweds have poured themselves into making it the coolest music venue in Canada east of Casa del Popolo in Montreal and the Dakota Tavern in Toronto. Like the Dakota, the Trailside features clever decor, an intimate atmosphere that charms musicians, and a short menu that delivers big for diners. The Trailside Café only has four main dishes, one of which is a daily special from chef Chris Coupland and another is an order of the best fishcakes you’re likely to ever taste. They are loaded with salmon and haddock, and go for just $15. You’ll devour them on one of the café’s tables that Meghann Deighan has decorated in inventive ways. On one surface, she has lacquered decades-old receipts from the property’s previous incarnation as a community co-op store, on others are black-and-white images and old movie posters. “We’re looking for low-cost solutions for improving the place and the property has an amazing history, so we figure why not use what we can that’s right here,” says Meghann Deighan while pointing out some of the old dusty bottles that are kept in the back of the store. The Trailside is the kind of place where the headline performer can stand at a bar drinking a beer while taking in his own warm-up act. Such was the case last Wednesday night, when Matt Mays headlined on back-to-back nights while his friend Adam Baldwin opened up. Seeing a musician of the calibre of Mays — a Juno nominee whose latest album “Coyote” is due out on September 4 — in a setting that holds no more than 50 people is a rare treat. It’s also good marketing for the Trailside, which is hopeful of attracting more people from Charlottetown and elsewhere in the Maritimes to its little spot on the side of the road in Mount Stewart, home to about 310 people. If reviews from customers during Mays’ show are an indication, the Deighans will do all right. Several attendees praised the café’s atmosphere and its menu. “The Trailside always had a good music scene but it needed a little more upkeep and we wanted to focus on improving the food. I think we have. I think Chris has hit it out of the park,” Pat Deighan says of his chef.